George of the Jungle, too. But practically nobody knows about The Hoppity Hooper Show, which was made by the same people and came right between the two. 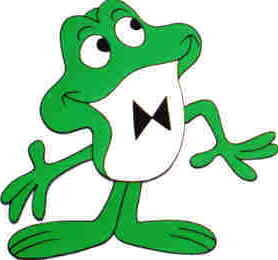 Hoppity Hooper (not to be confused with Hippety Hopper, a minor Warner Bros. character) was an innocent young frog lad (voiced by Chris Allen, who also did Scooter on Space Kidettes). His major supporting characters were a fox named Waldo Wigglesworth (Hans Conried, who also did Captain Hook in Disney's Peter Pan), who somehow managed to convince Hoppity he was the frog's uncle; and Fillmore (Bill Scott. who also did Tom Slick), a not-too-bright bear who liked to blow his bugle. They had many hilarious adventures together, as "Uncle Waldo" tried various improbable ways to swindle his way to wealth. Like many of Ward's major characters (starting with the first, Crusader Rabbit), Hoppity's stories were told in cliffhanger form. There were two episodes per show, bookending a variety of older segments (including Fractured Fairy Tales and Mr. Know-It-All) in between. There was even a segment rerun from a non-Ward show — "The World of Commander McBragg" came from Leonardo Productions (fomerly Total Television), the studio that produced Tennessee Tuxedo, Underdog and King Leonardo & His Short Subjects. The whole shebang debuted September 12, 1964, on ABC, which kept it on the Saturday morning schedule until '67. So — why isn't Hoppity as widely known as Rocky and George? Maybe the adventures were too cramped and crowded, as the network mandated a maximum of four episodes (two shows) per story. Maybe it was inconsistency of characterization — Waldo, at first a ruthless con man, later functioned as a more benignly-motivated private detective (possibly recycling plots from Phineas Fox, an unproduced series Ward had planned with animator/producer Shamus Culhane). Or maybe those retread back-up segments are what did him in. Whatever the reason, there were no comic books about Hoppity Hooper, relatively few toys, no Underoos. Today, the show turns up occasionally in syndicated reruns, but sightings are few and far between. Text ©2001-08 Donald D. Markstein. Art © Jay Ward Productions.